The app will also allow users to record their data-sharing, organ donor, and end-of-life care preferences. Thursday was the 70th birthday of NHS, formed on July 5, 1948 to bring together all health services under a single organization. The investment fund of David Einhorn – a long-time, vocal critic and stock-shorter of Athenahealth that he dismissed as “a business process outsourcer with a very promotional CEO” that stood no chance against Epic – is losing investors as the value of its investments dropped 11 percent from 2014 to 2017 as the S&P 500 rose 38 percent. Einhorn is also shorting Amazon and Netflix, which have gained value, and is long on Brighthouse Financial, whose shares have dropped 31 percent so far this year. 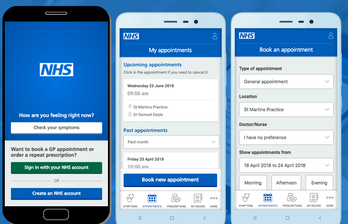 In England, NHS Digital awards IBM a three-year contract for cybersecurity services that include vulnerability scanning, threat detection, and threat intelligence. 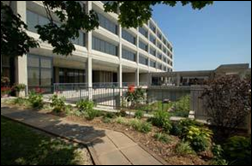 Atrium Health (the former Carolinas HealthCare System) chooses Golden Hour’s EMSHIE solution for exchanging patient information with emergency responders. Our Lady of the Lake Regional Medical Center (LA) hires Stephanie Manson, MBA, MS (Franciscan Missionaries of Our Lady Health System) as COO. Holzer Health System (OH) goes live on Athenahealth. Cleveland Clinic joins the list of hospitals that give patients access to their medical records on Apple Health Records. Apple lists more than 60 health systems that are participating in the Health Records beta. Politico reports that Cerner hired two former Congressmen as lobbyists for its VA project the day the contract was signed – Jeff Miller (R-FL) and James Moran (D-VA), both employed by McDermott Will & Emery. A former patient information coordinator at UPMC and Allegheny Health Network (PA) is indicted on federal charges involving her retrieval of the information of 111 patients and her disclosure of the information of three of them “with the intent to cause malicious harm” if an unspecified nature. She faces an 11-year prison sentence and a fine of $350,000. Facebook can continue tracking the browsing habits of people who have deleted their Facebook account, the company confirms, where it obtains information from any site that uses its Like or Share buttons or that runs Facebook ads to nag the former user into returning to Facebook and to serve them ads. 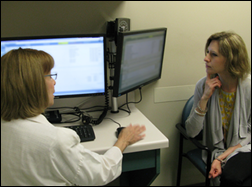 A small study finds that adding a second exam room monitor that mirrors the clinician’s EHR screen can be helpful in engaging patients. Patients liked the transparency, not having to look over the clinician’s shoulder in feeling engaged, and having the clinician’s conversation reinforced by seeing their information on the EHR screen. However, they found the EHR user interface, screen-flipping, and on-screen jargon confusing. Clinicians liked the ease of sharing information with patients, but noted that not all patients are interested. They also worry that raising more patient questions would extend visit time. Both groups noted that exam rooms were not well laid out for adding a second monitor. Epic adds to its quirky campus art collection by buying the old-fashioned carousel and decorations of the recently closed Ella’s Deli of Madison, saying that it was an easy decision to preserve part of the iconic landmark. In Wales, Assembly member Lee Waters says the country is struggling with NHS’s IT systems, claiming that the unreliability of its Cancer Network Information System Cymru (Canisc) is causing daily problems. BBC says the system is over 20 years old, is not supported by Microsoft, and went down 11 times in a recent four-week period, delaying some chemotherapy and radiation therapy treatments. 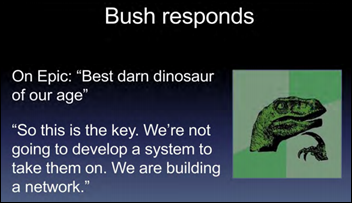 Do their systems get constantly smarter? Do they leave a large trail of proprietary data collected from interesting sources? Does their technology reduce the need for humans to be involved? Do the founders have deep technical understanding of machine learning models and how they can be applied to a large data set? Is their AI expertise so deep that they have an extreme advantage over competitors and can they attract the right talent to go after their market? Independence Day always generates some fireworks-related cautionary tales. 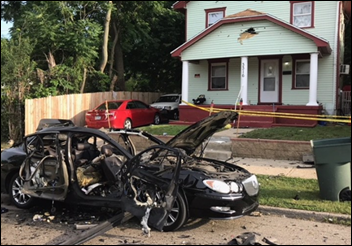 A Dayton, OH man who had just purchased fireworks couldn’t wait to light one and throw it out his car window, with his unsuccessful toss igniting his in-car stash and causing an explosion that severely injured him and several people nearby, set off car airbags down the street, and damaged a nearby house. A 21-year-old Maryland man sustains severe hand injuries when he tries to launch an illegal firework from a mortar over his head during a party, not realizing that he was holding the mortar upside down. A Florida man holding an M80 blows off all his fingers. Another Florida man loses his fingers and eyebrows when a mortar he had modified went off in his hand. Kudos to NFL’er Jason Pierre-Paul, who, as he does annually, posted gruesome photos of his July 4, 2015 fireworks-caused hand injury in warning people to be careful with fireworks (ESPN’s tweeting of a hospital OR schedule to scoop the world on his finger amputation kicked off a privacy firestorm, you may recall).